Environmental Protection Agency Administrator Scott Pruitt will soon end his agency’s use of “secret science” to craft regulations. Pruitt will reverse long-standing EPA policy allowing regulators to rely on nonpublic scientific data in crafting rules. Such studies have been used to justify tens of billions of dollars worth of regulations. “And we’ve said that’s fine—we’re changing that as well,” Pruitt said. Conservatives have long criticized the EPA for relying on scientific studies that published their findings but not the underlying data. However, Democrats and environmental activists have challenged past attempts to bring transparency to studies used in rule-making. Rep. Lamar Smith, R-Texas, pushed legislation to end the use of what he calls “secret science” at the EPA. Pruitt instituted another policy in 2017 backed by Smith against EPA-funded scientists serving on agency advisory boards. “If we use a third party to engage in scientific review or inquiry, and that’s the basis of rule-making, you and every American citizen across the country deserve to know what’s the data, what’s the methodology that was used to reach that conclusion that was the underpinning of what—rules that were adopted by this agency,” Pruitt explained. Pruitt’s pending science transparency policy mirrors Smith’s HONEST Act, which passed the House in March 2017. Smith’s office was pleased to hear Pruitt was adopting another policy the House Committee on Science, Space, and Technology chairman championed. 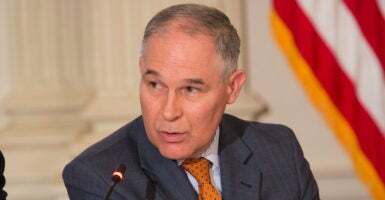 “The chairman has long worked toward a more open and transparent rule-making process at EPA, and he looks forward to any announcement from Administrator Pruitt that would achieve that goal,” committee spokeswoman Thea McDonald said. Junk science crusader Steve Milloy also called on the EPA to end its use of “secret science” in rule-making, especially when it comes to studies on the toxicity of fine particulates in the air. The EPA has primarily relied on two 1990s studies linking fine particulate pollution to premature death. Neither of the studies have made their data public, but the EPA used their findings to justify sweeping air quality regulations. Reported benefits from the EPA rules are “mostly attributable to the reduction in public exposure to fine particulate matter,” according to the White House Office of Management and Budget report. That’s equivalent to billions of dollars. In fact, one of the EPA’s most expensive regulations on the books, called MATS, derived most of its estimated benefits from reducing particulates not from reducing mercury, which the rule was ostensibly crafted to address. The EPA estimated MATS would cost $8.2 billion but yield between $28 billion to $77 billion in public health benefits. It’s a similar story for the Clean Power Plan, which the EPA estimated would cost $8.4 billion and yield from $14 billion to $34 billion in health and climate benefits. Democrats and environmentalists have largely opposed attempts to require the EPA rely on transparent scientific data. Said data would restrict the amount of studies the EPA can use, but a major objection is making data public would reveal confidential patient data, opponents argue. “A lot of the data that EPA uses to protect public health and ensure that we have clean air and clean water relies on data that cannot be publicly released,” Yogin Kothari, a Union of Concerned Scientists representative, told E&E News. Milloy, however, countered and argued it’s a “red herring” to claim that forcing regulators to use public science data would harm patient privacy. “The availability of such data sets is nothing new,” said Milloy, publisher of JunkScience.com and senior fellow at the Energy and Environmental Legal Institute.